Wrestlemania fallout | Kick Out At 2! Wrestlemania. The Showcase of the Immortals. The grandest stage of them all. The show that makes me reevaluate professional wrestling, yet again. Wrestlemania is wrestling’s Super Bowl. It’s Stanley Cup. It’s become more than just WWE’s annual big show. Over the last ten years or so, Wrestlemania weekend has become a celebration of all things wrestling. ROH, Evolve, and other indy companies always relocate to the Mania host city to do big shows that weekend. There’s Axxess, WWE’s fan festival where you can do anything from meet your favorite superstars to watch some live wrestling to walk through a mini museum of WWE’s past. There’s the Hall of Fame ceremony, where wrestling’s legends are honored. There’s WrestleCon and other wrestling events. It’s a big deal. It’s no lie or even a secret that we here at Kick Out at 2 have been out of the current product for a while. I still catch the PPVs and keep an ear to the ground on what’s going on with Raw, but in 2016, I have watched a total of two complete episodes of Monday Night Raw…and one was because I was at the event. As the injuries mounted and the card came together, we were not getting excited about Mania whatsoever over here in Ko@2land. Wrestlemania, however, finds a way. As Friday bled into Saturday and eventually Sunday, all I could think about was wrestling. There wasn’t a single thing on my television on Sunday that didn’t happen in a squared circle. I found myself getting excited. I found myself wishing I had called a few friends over and had a Wrestlemania party. I found myself wishing I was back in Virginia so we could have a Kick Out at 2 Wrestlemania Party ourselves, with blackjack and…well, I digress. What I’m saying is that the part of me that loves pro wrestling awoke and Wrestlemania was the full moon that brought it to snarling life. So, let’s talk about Mania. I’m not going to do a full breakdown like I do on Nitro or something like that. For one, there are other places that do that stuff with the current product. For another, from start to finish, Wrestlemania was almost SEVEN HOURS LONG! The pre-show started at 5, the show ended at fifteen till midnight. That’s ridiculous. I can barely stomach a three hour Raw anymore, so trying to write up seven hours would be maddening. For most of the event, I was on XBOX Live with Derick and Robbie, so I know their thoughts on the card and for almost every point I make, rest assured that I speak with the full authority of us here at Kick Out at 2. This card let me down. Just the card, out of the gate. Now, I know that’s due to injuries, so I’m not spending too much time on this, but going into the show, I was excited for THREE matches. Three…in a seven hour show. I wanted to see the Intercontinental Championship ladder match, AJ Styles VS Chris Jericho, and Shane McMahon VS The Undertaker. I’m not a Roman Reigns fan in the slightest, so that match didn’t have my attention at all…but we’ll get to that later on. We get the undercard on the pre-show, which I always feel bad for because these guys deserve to be on the main show. It’s telling at how bloated the roster is right now when you can’t fit your important guys on the show in five hours. I’m not exactly calling for a brand extension or a roster split…but we gotta do something here. Anyway, Ryback and Kalisto was a pretty decent match albeit one that looked like it was contested in front of about 45 people because of how early in the pre-show it happened. They’ve finally given Ryback a bit of personality, but he’s a heel now which is dumb. People like this guy as a monster babyface. Do that. The Total Divas VS non-Total Divas match was useless except to let us know that there are at least 13 women in this division, which is ridiculous when only about six of them can put on a decent match to save their lives. We were treated to the in-ring debut of Lana, which was meh, and the main roster return of Eva Marie, which was totally useless. Brie Bella wins with the Yes Lock, which I liked. Usos VS Dudley Boys was nothing special but it was interesting when the crowd booed the crap out of the Usos at the end of the match. So, on to Wrestlemania! I enjoyed the ending to ONE match. ONE! The Intercontinental Championship match was awesome and was the match of the night and the moment of the night for me. I was legitimately excited to see Zack Ryder win and I hope that he gets a push that continues for a long time. He’s earned it more than anyone else on that roster. The Divas…nay…Women’s Championship match was pretty good. I’m not invested in any of these ladies, though, so Charlotte winning didn’t do much or detract from anything for me. It simply was. I did like Sasha wearing tights commemorating Eddie Guerrero, though, as well as Charlotte coming out in a robe made of Flair’s 2008 robe. That was pretty tight. I like the new Women’s Championship belt as well. It’s way better than the Divas title. I’m also very glad the Divas moniker is gone. Why’d New Day lose? They’re the hottest thing WWE has right now. I get that the loss doesn’t hurt them, per se, but still, send people home happy. Or, was sending people home happy why we got the three legends coming out to beat down the League of Nations? I’m not going to lie, I marked at this. I enjoyed seeing some Stone Cold Stunners get tossed around. This, along with Zack Ryder, made my night. Ambrose losing was probably inevitable, but I think they could have done more in building him up to be a legit threat to Lesnar. I never felt that Lesnar was in trouble through the entire match. Plus, I’m getting tired of Suplex City. Brock is a great wrestler, but his entire repertoire has been reduced to two moves. I’m over it. Brock got the win and deserved it, but they’ve basically established that no one can beat Brock. He’s Godzilla. Who’s that going to help? Roman Reigns wins the WWE World Heavyweight Championship for the third time. There’s so much about that sentence that makes me unhappy. Like I said before, I’m not a fan of Roman Reigns. He has no charisma. He’s not a great wrestler. He can’t talk to save his life. I just don’t like him. Nothing against him…I just can’t get into him. He was my least favorite part of The Shield but he’s the part that’s getting shoved down my throat week in and week out for the last year. I’m not alone in this. 100,000 people booed the living crap out of Roman Reigns last night. They booed him so much that they had to lower the mic volume to keep it from sounding bad. This was so apparent that one of my 9th graders came in today commenting about it. The “WWE Universe” does not want Roman Reigns as champion. For the last two months they’ve been telling WWE that at Raw, Smackdown, and live shows. HHH has been the odds on babyface through this entire feud and has been cheered relentlessly for it. He was the man last night and he was who everyone wanted to see win. Except he didn’t. Vince didn’t listen to his audience. He didn’t listen to his fans. He didn’t listen to the people who pay for tickets and merch and the WWE Network. Nope…he gave Roman the belt. For the third time. You see, I can deal with a champion I don’t want. But I can’t deal with one that now only has one less world title reign than Shawn freaking Michaels! WWE does this stupid thing recently where a guy’s first title reign or so doesn’t matter. Roman wins it in November…boom, Sheamus cashes in on him. He wins it a month later…boom, HHH wins it from him in the Rumble. So, now, he’s a three time champion out of nowhere, the crowd still can’t stand him, but there we go. One would think this would be my biggest issue with last night, but that one is reserved for…. WHY DID SHANE McMAHON LOSE?! What the living hell, WWE?! Now, I understand that having a 46 year old man who was never a legit wrestler come out and beat the Phenom seems kind of silly, but you have to look at the narrative that went into that match. Shane comes out two months ago and says he’s going to be the voice of the people and he’s going to change the sinking ship that is WWE for the better. He’s going to wrest power away from The Authority and take back Monday Night Raw, as well as his legacy as Vince McMahon’s son and heir apparent. Then, after last night, it’s just over. No change. No Raw is Shane. No nothing. Just the same as it ever was. With this angle, WWE came out point blank and said yes, our ratings are tanking. Yes, we know we’re not as awesome as we once were. Yes, we know you hate The Authority opening the show with 20 minute glad-handing promos. Yes, we know you want it to be better. They gave that potential change a face. A face we all love. A face some people have legitimately been wanting to show back up and wrest real life control of the WWE back from his father, sister and brother-in-law. They gave us Shane o’Mac; a man who’s awesomeness is only topped by his fire shoe game. Then they beat him and took it all away. Go back and watch the very end of that match. Taker sarcastically pats Shane on the cheek as if to say “it’s so cute how you thought it would change…”and then plants our hopes and dreams of a new day on Raw tonight right on their head in the center of the ring with a Tombstone piledriver. 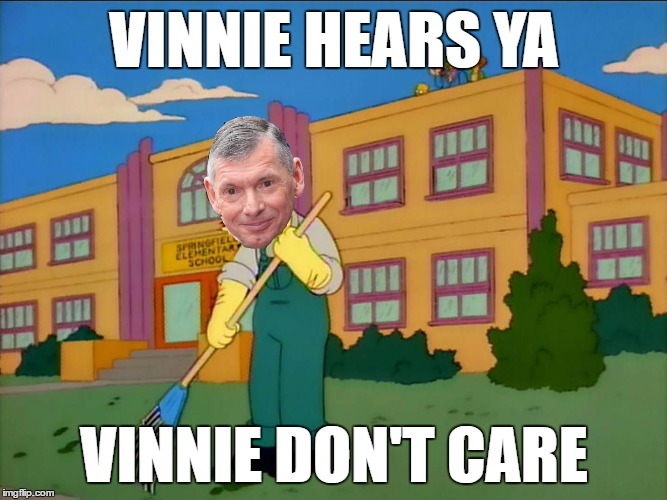 With that match, Vince McMahon told the fans watching the WWE that he hears their complaints…and that he just doesn’t care. Damian Sandow tweeted out today that if we have opinions, make sure they hear them tonight. Now, Damian was speaking in reference to the ovation he got in the Andre Memorial Battle Royal last night. If we’re a fan, tell WWE so they’ll know. Unfortunately, Damian, we’ve tried letting Vince know what we think. We tried it at the Royal Rumble last year. We tried it at Wrestlemania last year. We tried it at the Royal Rumble this year. We tried it through the entire lead up to Wrestlemania. We tried that AT Wrestlemania. Hell, we even tried it a few years ago WITH YOU. If it’s not in Vince’s master plan, he’s not listening. What he wants to happen is what’s going to happen, us be damned. I always hold NXT up as proof that this company can run a wrestling promotion the way that fans want. NXT has long term storytelling that makes sense. NXT has great wrestling action. NXT has minimal intrusion from “authority figures.” NXT put on a show on Friday with not a single gimmick match. Just singles matches and tag team matches. It blew Wrestlemania out of the water. It’s not even close. NXT: Takeover is the better wrestling show. And they accomplished it in two hours. WWE, the biggest wrestling promotion in the world, took seven and was really only able to piss me off. This company knows what to do…they just refuse to do it on a larger scale. I’m going to wrap up with this. Wrestlemania is in Orlando next year. Four hours from my apartment here in Miami. Until last night, all I could talk about was getting a group together to hit Mania weekend and everything that comes with it. Last night, after the show had gone off the air, that desire was gone. I still want to go to Axxess. I still want to go to the Hall of Fame. ROH shows sound awesome. NXT Takeover sounds phenomenal. Wrestlemania…yeah, I may just come on home and catch that one on the Network. Tonight’s Raw…normally the best Raw of the year…I really don’t want to watch it. I may not. I’m not one of the ones who’s going to tell you to cancel the WWE Network over this, because as long as they offer the thing, I’ll never cancel it. I love wrestling and wrestling history too much to lose access to as much of it as the WWE gives me. But…I’m even more out of love with WWE than I’ve been in a while. I won’t be going to the Smackdown show in June. I won’t be going to any live events. I probably won’t be watching any PPVs for a while. No, I’ll stick with Nitro, and NXT, and stuff like that. It’s weird…this company puts out things that I enjoy…I just wish a few of them could happen in the ring with the main roster.